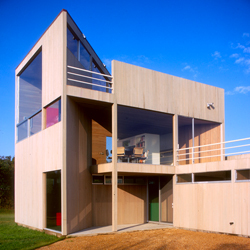 ﻿﻿﻿﻿﻿﻿In 1965, a young Charles Gwathmey began designing a house and studio for his parents in Amagansett, Long Island. 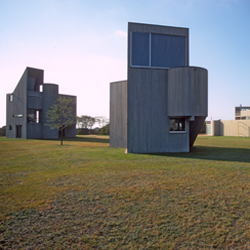 With their earthy and simple geometric shapes (cylinders, rectangles, and squares), Gwathmey’s structures, the first of their kind, revolutionized the landscape. Gwathmey was an innovator, purist, and one of the New York Five—a group of architects also known as the “whites” for their adherence to the tenets of High Modernism. 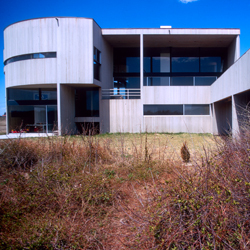 He would later come to be known as THE Hamptons architect: the one that other architects imitated. 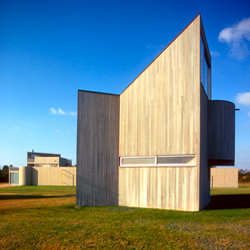 In 1971, Bill Maris captured the formal, sculptural quality of Gwathmey's small-scale structures in the lone image that survives in this collection.